Of all the phrases and fancy terminology the sociologists and youth culture "experts" use in defining this generation. I would say out of hands on experience working if they could come up with words to define their own generation they would be "trust issues". Last night I sat with a group of teens at a park. It was a bright and warm sunny day but you wouldn't have known it from looking at them. Oh they were laughing and talking like normal kids. If you walked by you wouldn't have noticed it. I barely did and it was really after the fact that I did. They are so desperately alone and don't let anyone close enough to really help because they are so afraid of being hurt by those who come to help. They say it themselves in the all to familiar phrase: "I have trust issues." And no wonder. I'd say 90% of them come from broken families. I would assert more than broken they are failed attempts at family. The ones in their lives who should be the closest hurt them the most. Some there at the park have endured beatings. Some are trapped in between their parents drowning marriage. Some just switched living between parents houses due to some atrocity. Some went home to a parent passed out from drinking. Some are so sick of it they didn't go home at all last night. The issues they have with their families is all they know. Any inconsistency in their friends and they project it all on their friends. It's all they know. I could go on but the fact of the matter is trust is being sure of something. Reliability. Trust is build on the feeling that you can be sure of something. Can they be sure they wont get hurt? Can they the be sure they wont be betrayed? Can they be sure they wont be lied to and manipulated? Do you have the answers? I don't. I want to point them to a source of true trust: Jesus. He is the one who is capable of always being there. Who will love them and never reject them. When I met Jesus it was the same deal. He said, "Ill never leave you, never forsake you" and he never has. 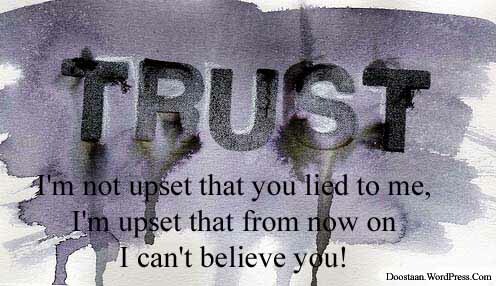 However when you have trouble trusting the people you can see you definitely project that onto the one you can't see. God bears a lot of blame he doesn't deserve. They can't be taught of God's faithfulness they have to see it in action. They need a mission. Something to drive them forward and together at the same time. That and they need a hug. Don't we all?